Cycle America apart from the competition. Why? 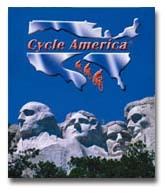 Cycle America is bicycle touring, first and foremost. The mileage and elevation gains are challenging and doable. We serve tasty, hearty fare and plenty of it. We transport your gear and offer solid support, you just ride. As we prepare for another spectacular touring season we look forward to hearing from you and hope to ride with you this summer. Consider adding your address to our mailing list and we'll send you helpful updates and tour information. Private and Secure. Coast to Coast is nine distinct, fully supported tours that connect to make one epic journey. Our trip is designed for those who want to ride one, several, or all nine weeks for the full northern experience. 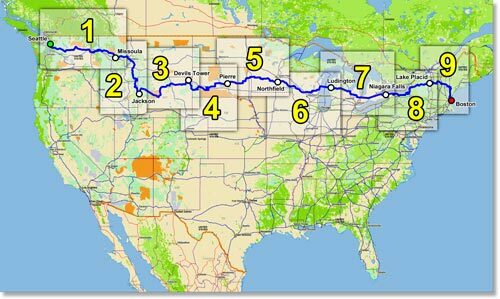 Whether you cycle cross country in one year or over several, this is a journey of a lifetime. Discover your next cross country bicycle adventure. Note: A Charity Option is available for riders who want to combine their summer adventure with a good cause. At Cycle America we're working hard to make this summer the best ever and we look forward to seeing you on the road. 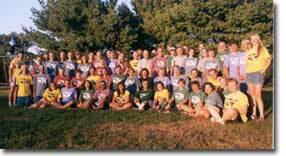 Join the Cycle America Staff Become a member of the seasonal tour staff and prepare for an exciting summer experience. This is a unique opportunity to work and travel, encounter new people and build lasting memories. Submit an online application or call 800-716-4426 to learn more.